The Create & Edit View (also known as input mask) is your tool to breath life into your agenda. Apart from some general information about an event (i.e. date/time, title, calendar) you are also allowed to add some more specific information and features, like attendees, reminders, repetition rules, description or status. We think that most of the fields inside this view don't need a detailed description. Nevertheless there might be some points which may be hard to understand without any calendar experience. 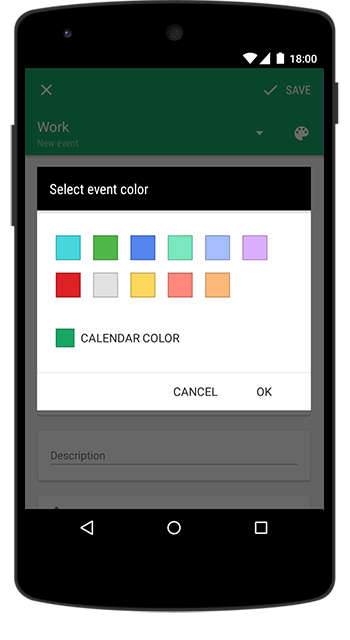 Right at the top of the scrollable screen within the input mask you will find a colored bar which shows the current calendar and the corresponding event color. 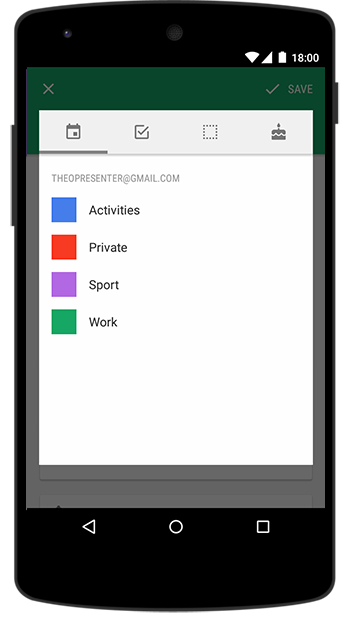 To change the calendar please tap the left side of the bar and it will open a drop-down menu with every activated calendar. If you want to change the color of the event directly, please click the small color palette icon on the right. In the next screen you should be allowed to pick one of the available colors from the color selection. Hint: Please note, that this selection is limited due to sync reasons and cannot be altered. You ca, however, set any personalized color for your calendars in ­→ calendars & task lists ­→ pencil icon ­→ change color. When creating an event, you may wat to distinguish it from other. You can do it by changing the color or by adding an outstanding emoticon. Next to the event title you will spot the emoticon icon, which opens the emoticon preview. The emoticons are categorized thematically and you can access a single category by clicking a corresponding tab. More detailed information here. The location field is used to attach a location to an event. If there are locations you use very often, consider to use of the location history. You can access it by clicking the small button at the right of the field. 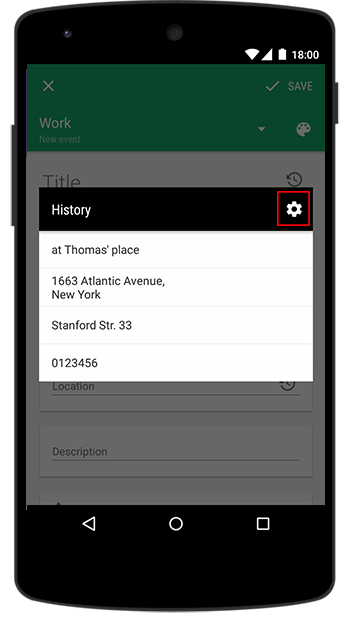 If the history is empty, you are advised to fill the history automatically from available events with a location from your database. Please remember that the Business Calendar 2 will automatically fill the history, if you enter a new location. Once the history is filled with items you can use the small gear-button to access the options (i.e. if you want to clear the history). Please find some more information on the function here. Business Calendar 2 allows you to set numerous different repetition rules for an event. First of all please tap the spinner button. A new pop-up windows is being opened where you can adjust the repetition rules for the event series. 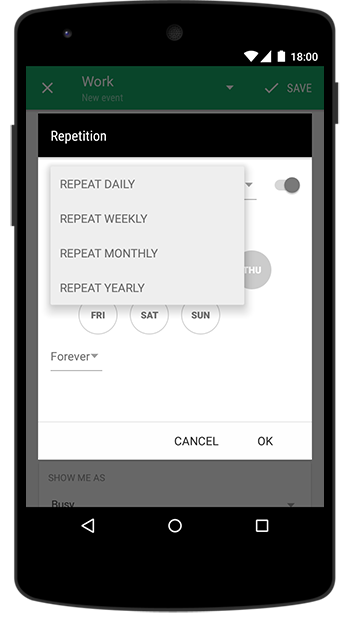 If you picked a rule of your choice you can also set an end-date or a certain number of repetitions. Hint: There may be different ways to set a certain repetition rule, for example if you'd like to enable a biweekly occurrence you can either select Weekly and Every 2 weeks or you can choose Daily and Every 14 days. 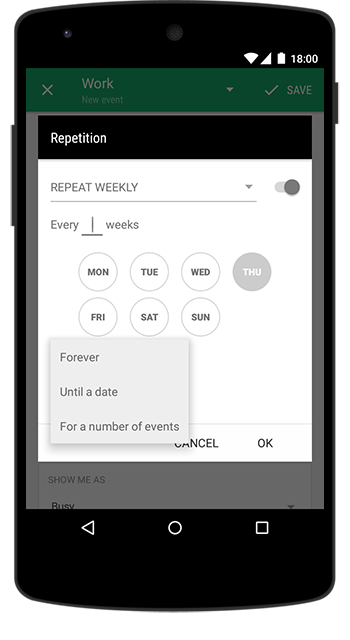 If you want to create an event, which repeats yearly on a particular date, use the monthly repetition rule and set it up to repeat every 12 months. The attendee field is used to send invitations to any guest, no matter if the person is in your contact book or not. This field accepts standard email-addresses or first/last name of a person. In both cases an auto-suggestion works in the background and starts to give you some ideas after entering at least two characters. Please remember that only contacts with an email-address make sense in this field! Furthermore, please remember that the calendar for this new event with attendees should be a synchronized one. Otherwise the synchronization functionality of the Android OS is not able to send the invitations at all. As an example the invitations within a synchronized calendar called "john.smith@gmail.com" will make it. Invitations entered into an event for the calendar called "MyCalendar (local calendar)" won't make it. Similar to the location field the attendee field uses the history function, too. Therefore it saves previously entered content automatically. 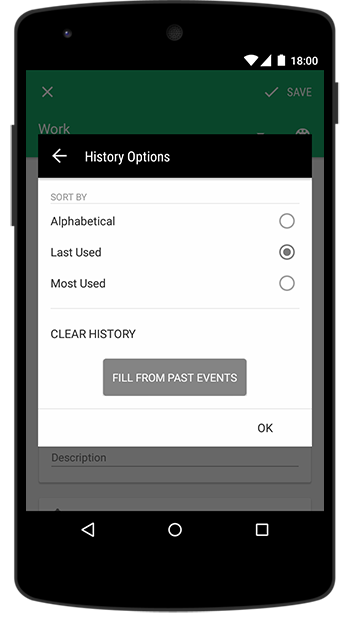 If your history is empty you can auto-fill it by tapping the small history-button at the right of the field. Please remember that the gear-button at the top right of the history-window allows you to access all the history settings. 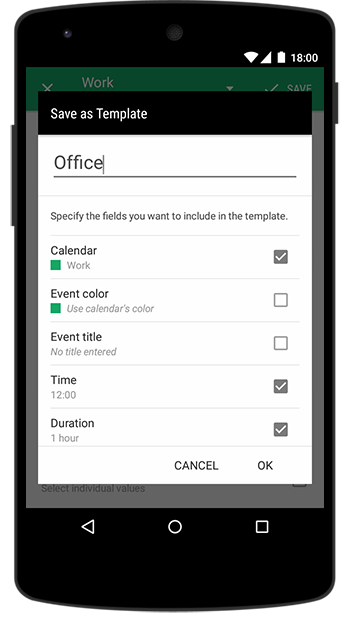 The "Show me as"-field is normally used for people with shared calendars. A famous example is the Google's "Find a time" feature. 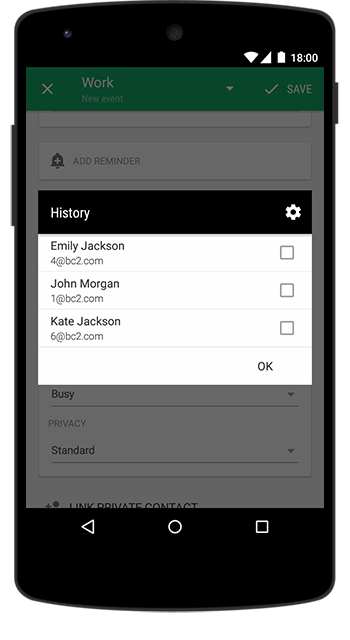 If you are the owner of a shared calendar, you can check whether the guests of it are available on a certain date and time. 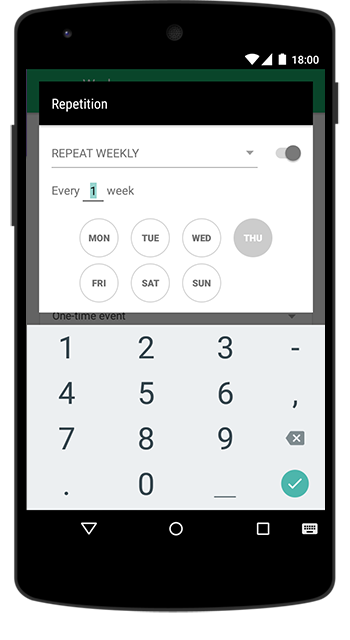 Hint: If you are using a calendar synchronized with Google you can change the calendars default privacy within the calendar settings of the Google Web Calendar interface. The feature to link a contact with an event sounds similar to the attendees mentioned priorly. 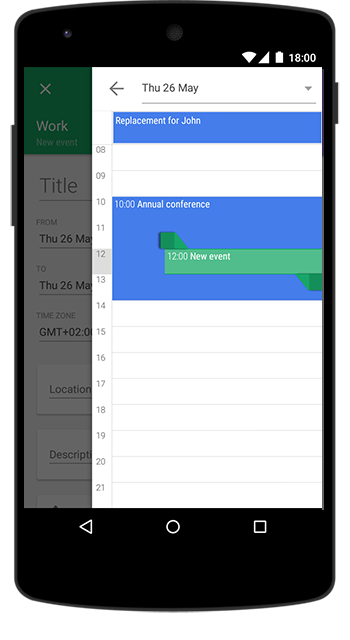 Unlike the attendee feature this tool does not require a synchronized calendar to work properly. If you tap the button, your contact book is opened and you can choose one contact to link with. This contact is mentioned in the event details screen again. Here you are allowed to interact with if needed, i.e. you can start phone calls, send a SMS or email to the person etc. 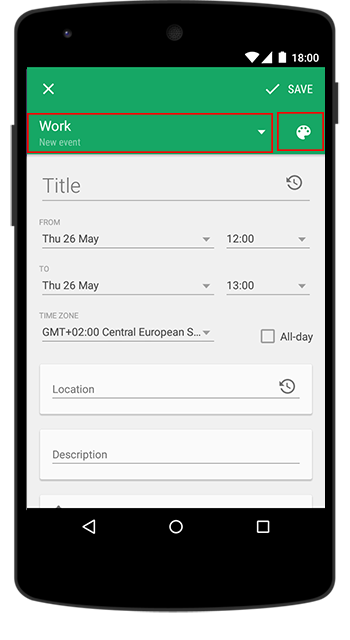 A template can be used to save time if you plan to create appointments with similar or the same properties. Clicking this button will open a window where you can enter a title and specify the fields of the current event you want to include in the template. You can choose every field available in the input mask for events. After closing the template options please choose between the options "Save event and template" or "Save only as template". Now you can save the template and you can use it for every new event. Just click on the spinner button at the top of the input mask and choose your desired template out of the drop-down menu. Hint: If you like the drag&drop mode in the week view you can also use the special time selection drawer. It appears when you swipe from the right edge of the screen and/or at the beginning of each event creation process (if the corresponding option has been chosen in the Business Calendar settings). This view can be used to drag&drop the current event or to move the other events on that day around. Furthermore you can use the time select handles to change the start and the end time of the current event. To create a new task please change to the task creation mode by using the spinner button at the top of the screen. In the drop-down menu please select "New task" and the input mask will change a little bit. Additional to the input mask for events you will find a card to set a task priority. Everything else is very similar to the event creation mode.